Stanley Allen has been in the saddle making business since 1985 and comes from a ranch and rodeo background. Stanley knows saddles, how to fit them to you, and also how to fit your horse. We done business with him for years and always been treated fairly. He stands behind what he sells and keeps his promises. The quality of the leather and the workmanship are excellent. Allen Saddle Shop carries good quality tack and equipment at a reasonable price. The staff knows and understands what you need and are willing to help you find it. Whether you are looking for a rebuilt used saddle or a new custom one, you might check with Stanley before you buy to see what he has available. We sure like doing business with a live person who knows what he’s doing rather than those online companies that sell you junk. Here are a few more details of the Labor Day Weekend trail ride. Friday night starts with a ” Meet and Greet ” social. Saturday night is a covered dish dinner. OETRA provides the meat, beverages and paper products. You are asked to bring a side dish or desert to share. Event Fee: $10 per person or $40 per family. Camping fees are extra. You can contact Eva Lambert, lambert1249@msn.com 405-912-4696; Cell (405) 317-9376 for more information. 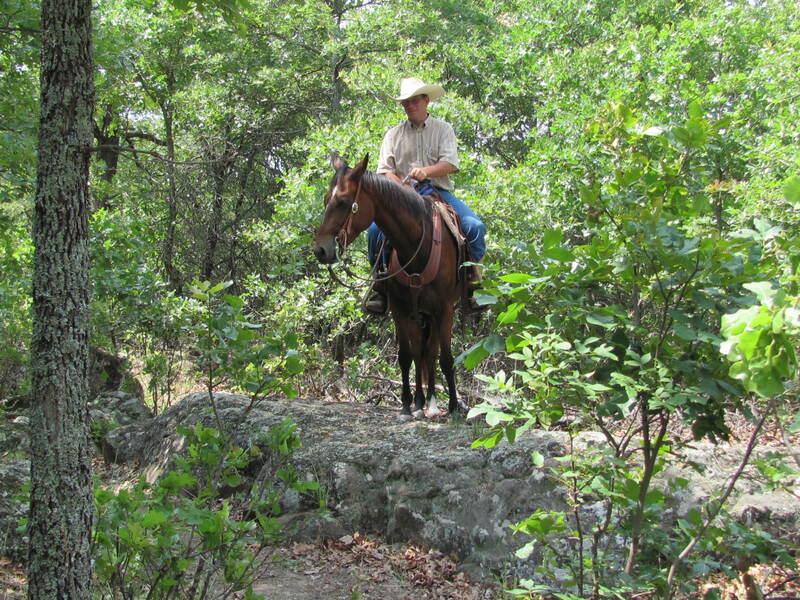 Oklahoma Horse Online reports the Robbers Cave Trail Ride sponsored by the Oklahoma Equestrian Trail Riders Association ( OETRA ) is scheduled for August 31 to September 2, 2012, Labor Day Weekend. Events like this one can be obtained from Oklahoma Horse Online by checking the calendar. 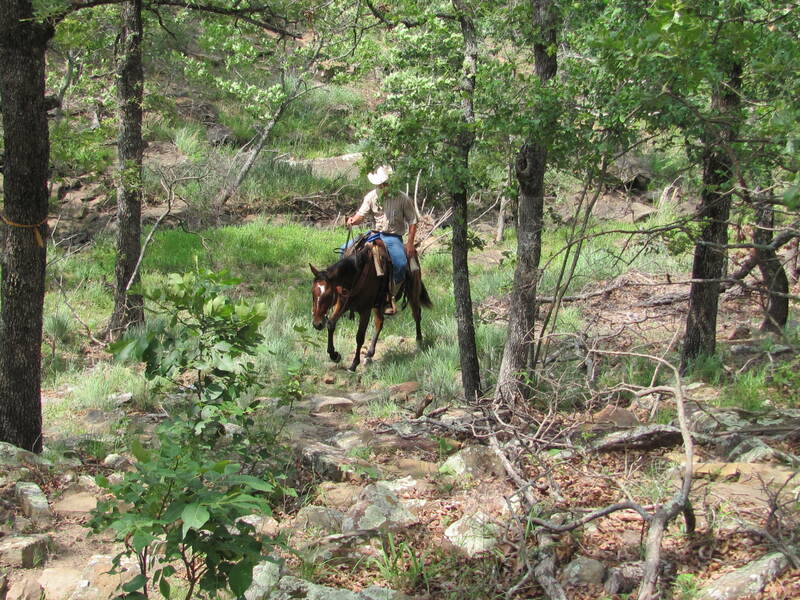 A really nice resource for Oklahoma trail riders. Ads are really reasonable for the internet exposure you can gain. The internship program this Summer has worked out well. Of course, we started with a great intern, a key ingredient. But it’s nice to see the progress of a young person and see the skills and confidence develop. Our ranch only takes enrolled students in an equine program or recent graduates from an equine college or school. We want the students that come here to be people with the desire to develop horse skills that will be used in their career. It is the mentoring everyone in the horse industry owes to the next generation. We don’t offer lessons in shoveling manure or cleaning stalls, but lots of riding and first hand training with a professional trainer. The results are fabulous. The students grow and learn techniques and skills that we hope will last a lifetime. Watching this Summer’s intern has been a real joy and we already know she is going to make a superb veterinarian!!! Although Pete is only halfway finished with our two-year program, he neck reins better than a lot of horses. Pete will go any direction including reverse with two inches of movement. Much like a kid with a joy stick, you can rest your wrist on the saddle horn and ride along. You never have to move your hand off the horn to change directions. You just move your wrist a little and turn. Although we expect all our horses at graduation to handle in a similar fashion, Pete is head of his class for now. Training in neck reining starts the first week at this ranch by making small little lessons that fit with the other training that builds to the point that most of our horses understand the concept of neck reining in the first 60 to 90 days. By not cramming these important lessons into a fixed or rigid schedule, it allows them to complete the neck reining part of the program slowly and at a their own pace. This slow, steady repetition produces a horse that wants to respond to small movements voluntarily and gives you a flexible, soft neck that makes the horse easy to ride. No doubt some horses, just like Pete, take to it faster than others. Pete has the cutting horse and reining horse blood that makes him a natural. He likes to work the livestock and enjoys the task of moving and herding them. For me personally, I just like to ride along with my hand resting on the saddle horn like a kid with a joy stick and look at the beautiful scenery as we go by. Ahhhhhhhhh the lazy way to trail ride! Training logs are part of the daily program we use in training our horses for several reasons. The obvious purpose is so we can see what the horse has done over time and chart the progress. Just like in school, the teacher sends home report cards so the parents can see the advancement. We periodically look at the horse and the development of his skills to make sure the desired development is taking place. We also keep logs to show people what the horse has been doing during the two years of our trail horse program and the activities of the training by hours spent. If you want to know how many hours any of our horses were ridden with someone in the saddle, you can find out. We don’t view training as 30 days, 60 days, or even months. Training is logged by hours in various activities including leading, tied standing, working on leads, trail training, etc. Simply saying a horse has 30 days training doesn’t tell you a lot. With some trainers it could mean as little as 2 or 3 hours of actual time with someone sitting in the saddle and riding the horse. In our opinion, trail horses need ” lots of wet blankets ” meaning a lot of time being ridden under all kinds of conditions. We keep logs to show the activities of the training and the progress for our own use and yours. Unlike some ranches with horses for sale, we want our customers to be able to see the training provided and understand the commitment we make to develop sound, reliable trail horses. Our belief is the logs help a person interested in buying a horse to know what they are getting. Guess it is kinda like going in for heart surgery, sorta like to know how many procedures Doc did last year and how many made it before he starts ” cuttin “. These trails are used by Americans all over the country and the benefits to the horse industry are significant. Now we don’t like taxes anymore than most folks, but sure rather see it spent on horse trails than some of that stuff they call art. Besides no one can call it ” pork ” when it’s for horses! We like cow horse and working horse blood lines for trail horses. So we applaud the efforts of Oklahoma Foundation Quarter Horse Registry . It says ” The purpose of the Foundation Quarter Horse Registry is to preserve, protect, and perpetuate the working cow horse blood lines of the Foundation Quarter Horse by the individuals that the FQHR deems as Foundation bred. ” These are the blood lines are historic and produced countless champions. More important, these same blood lines have generated untold numbers of quiet and calm trail horses. One of our primary objectives is a trail horse that can go all day with plenty of ” get up and go ” but able to tackle the unexpected without getting overly excited. Cow horses by nature have to go from a slow walk to working cows out of the brush at a dead run in seconds. They are expected to go right back to a walk once the cow work is finished. This innate ability to change gears from full speed to slow speed in just a few steps is perfect for a trail horse. When the unexpected happens, the horse can react to the situation and return to a relaxed state using its own natural tendencies and characteristics. Coupled with the right training, these horses learn to go right back where they were quickly. For a lot of us, this is really important. Sure things happen on the trail and no amount of training will cover every possible contingency. So we want horses that recover from the excitement and return to everyday normal fast. Put in everyday terms, we all know people who become upset over something and take days, if not weeks, to get over it. Others take things in stride and move on about life accepting life as it comes. Horses are just like people and some are better at overcoming the challenges thrown at them. We want our horses settled down pronto, not several hours down the trail. Thanks again to the Oklahoma Foundation Quarter Horse Registry for helping preserve the genetics for trail riders ( and cowboys too )!!! A moonlight trail ride is scheduled July 28th starting at 6:00p.m. with the Trinity Trail Preservation Association. (TTPA) was established in 1996 as a non-profit all-volunteer trail preservation organization to care for and maintain the 25.5 mile long trail on Corps of Engineers land on Lake Lavon and encourage hikers, joggers, nature lovers, photographers, and trail riders to use the scenic trail. The added benefits of joining the group according to its members is, ” Membership in the TTPA gets you involved with a group of wonderful people. Our primary focus is trail riding, and once you become a member you will receive a monthly news letter that will inform you of all the news and upcoming events. There are approximately 200 members at this time, and there is a wealth of knowledge and friendship among us. Most of us ride other trails as well, so typically you will see other TTPA members at any time on trails somewhere in Texas or Oklahoma. TTPA sponsors trail rides, barbecues, seminars, and fundraisers. No matter which events you attend, you’re sure to have fun! 30 Days and I’ll Make Em’ A Trail Horse! We met a horse trainer a few years ago that still stands out in my mind. He had a horse for sale that we went to see, but it wasn’t what we needed. Unable to convince us to buy the horse, he went to work selling us on letting him train a horse for us. Full of great promises, I vividly recall his committment to break, train, and have any horse we wanted to bring him ready for the trail in 30 days. His self-confidence and bold assurances, would have been convincing if I hadn’t already owned a number of horses over the years. At 30 days, a horse is green broke, I don’t care who trained him. Training takes time and anyone who tells you otherwise is giving you stuff that makes the grass grow green! And I don’t mean brown sugar! A few months later, we saw the man’s name surface in a blog a woman wrote. She was angry having almost been injured when her well-trained in 30 days trail horse apparently forgot some of what he learned. The wreck almost got her badly hurt and left her scared. I ran across the guy again recently and he is still training horses. Sad because he still has big promises than can’t be kept. The charm and charisma let him sell folks on the idea that 30 days is all it takes. Use your common sense when you go to buy a horse and listen to those little warnings in the back of your mind. If something doesn’t make sense, there is probably a reason. Good horses are the product of lots of wet blankets and hard work! It doesn’t come in 30 days! I will guarantee it! You are currently browsing the horsesfortrail blog archives for July, 2012.